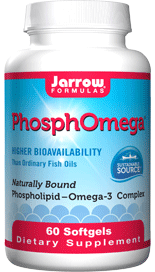 Jarrow Formulas Q-absorb Co-Q10 is a completely natural proliposome lipid-soluble delivery system that restores Co-Q10 levels reduced or depleted by the use of stains. Co-Q10 helps support heart function and provides antioxidant protection. Q-absorb® is a completely natural proliposome lipid-soluble delivery system clinically shown in humans to increase Co-Q10 levels up to 400% (3.2x) over baseline and 3–4 times better absorbed than chewable Co-Q10 tablets. Derived from fermentation Co-Q10 consists only of the natural trans configuration, the same as is synthesized in the human body. Co-Q10 supports heart function as a component of the electron transport system needed for ATP (i.e., energy) production within the cells, and as an antioxidant protects mitochondrial membranes and cholesterol from oxidation. 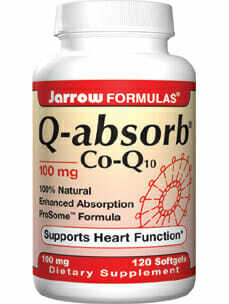 Q-absorb restores CoQ10 levels reduced or depleted by the use of statins. 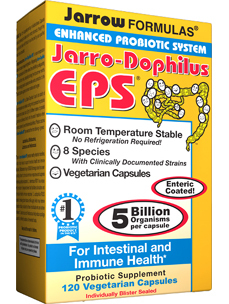 Take 1 softgel up to 3 times per day with food or as directed by your qualified health care consultant.